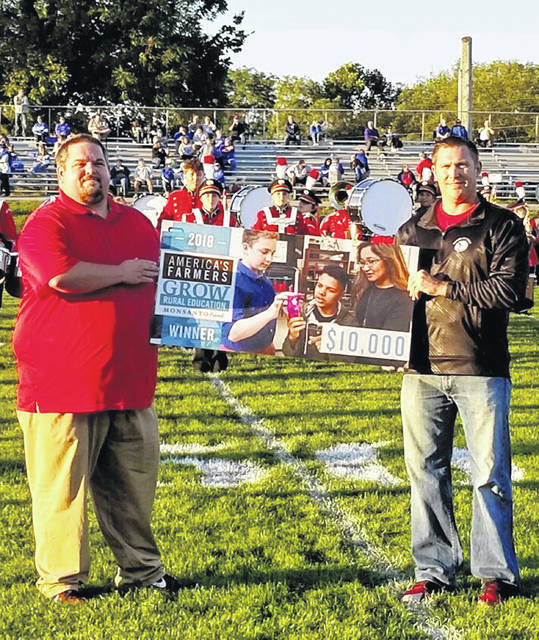 Hillsboro High School received a $10,000 grant from Monsanto at last Friday’s football game. The school nominated by Kevin Surber, a local farmer, to receive the grant. Pictured are T.J. Crowder, a Hillsboro teacher who helped write the grant and Tim Davis, superintendent. America’s Farmers Grow Rural Education called on local farmers to nominate rural schools to receive nearly $2.3 million in grants to enhance their science, technology, engineering and math (STEM) programs. Local farmers answered the call and the Grow Rural Education program, sponsored by the Monsanto Fund, has recognized Hillsboro High School in Highland County with a $10,000 grant. Hillsboro High School is just one of the many success stories of the Grow Rural Education program. For each winning school, teachers, students and oftentimes, community members work together to make STEM programs more engaging. Hillsboro High School will use the Grow Rural Education program funds to enhance its robotic program. To qualify for a Grow Rural Education grant, farmers nominated a public school district to compete for a merit-based grant of either $10,000 or $25,000. Nominated school districts then submitted a grant application that outlined how they would use the funds to enhance their students’ STEM education. A panel of qualified teachers review the applications and narrow it down to the finalists. The program’s Farmer Advisory Council, consisting of approximately 30 farmer leaders from across the country, then selected the winning school districts, including Hillsboro High School. Since Grow Rural Education began in 2011, it has awarded more than $16 million to more than 900 school districts in rural communities across the United States. To view a complete list of winners or to learn more about the America’s Farmers Grow Rural Education program, visit GrowRuralEducation.com or follow along on Facebook at facebook.com/AmericasFarmers. Submitted by Erin Glarner, America’s Farmers Grow Rural Education.